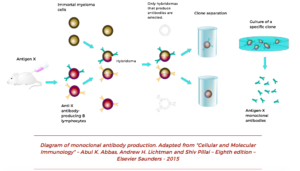 In 1975, Milstein and Köhler discovered monoclonal antibodies1 (see article: “What is a monoclonal antibody?”), starting a revolution in the diagnosis and treatment of many diseases1. Their widespread availability has been made possible thanks to the development of manufacturing processes using cell cultures2,3. The industrial production of monoclonal antibodies starts in the laboratory3 by inserting an antigen (a molecule that can trigger immune response) into a mouse. The mouse starts to produce B lymphocytes (antibody-producing cells) to defend itself against the antigen4. These cells have a short life span and fuse with immortal tumour cells (usually myeloma cells), producing so-called hybridomas5 (immortal cells that have the ability to produce antibodies)5. 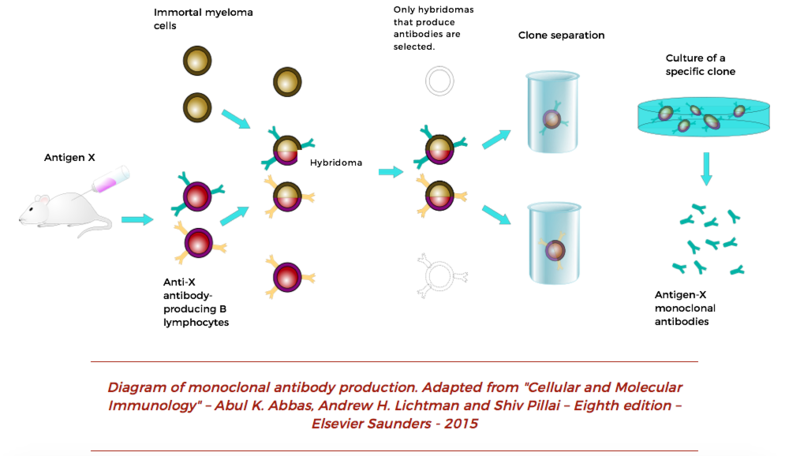 Several B lymphocyte clones against the antigen have been extracted from the mouse, so hybridomas that will be able to produce various antibodies against the antigen are obtained. This is a mixture of polyclonal antibodies5. Then the hybridomascoming from a single B lymphocyte are selected, thereby obtaining an immortal cell that produces only one type of antibody. This is a monoclonal antibody5. The antibodies produced by the mouse’s hybridomascan be rejected by the human body (they are recognized as foreign and trigger the immune response). Methods have been developed to generate antibodies similar to those produced by the human body, humanized antibodies, in which only the part of the antibody that recognizes the antigen comes from mouse3. Cells and culture medium are put into containers called bioreactors3. The most efficient are those in which the cells are in suspension in a liquid culture medium3. There are several types of bioreactors according to whether they are disposable or not, how they air the culture, the control of medium conditions and the collection of the antibodies produced3. At mAbxience, we use disposable or single-use bioreactors. These bioreactors provide greater flexibility, enabling changes in the medicinal product to be manufactured in record time. Furthermore, they eliminate any possibility of cross-contamination throughout the production process. In addition, using this technology allows us to significantly reduce resource use during production processes due to its industrial efficiency, since these bioreactors reduce water consumption and cleaning agents by 80% and 90%, respectively, thereby reducing the environmental impact of our facilities6. The antibodies extracted from the bioreactor arepurified and concentrated to be used in the production of medicinal products7. As can be seen, great efforts are required in research and development in order to make monoclonal antibodies available as daily treatments for a growing number of diseases1.